I am 55 years old, and I have only had two sets of silverware in my lifetime. 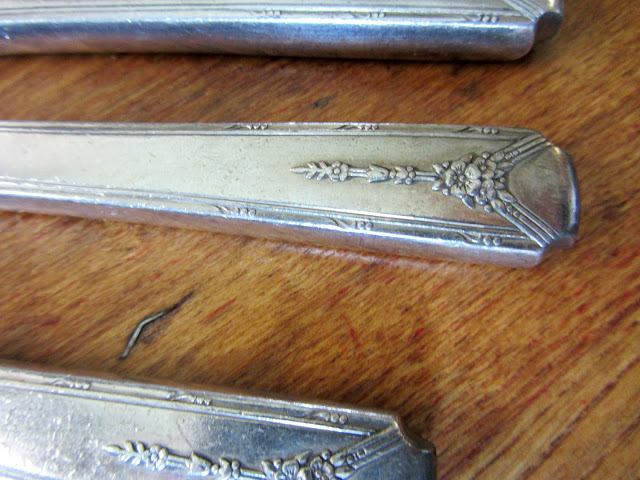 The first was marked Northland, Made in Japan, a very ornate pattern. The second by Oneida Deluxe. Both stainless. I was lucky enough last week to find an 8 piece place setting, almost, of Oneida Community Silverplate Milady Floral Deco pattern. According to what I have learned from the internet, this set dates back to the 1940's. 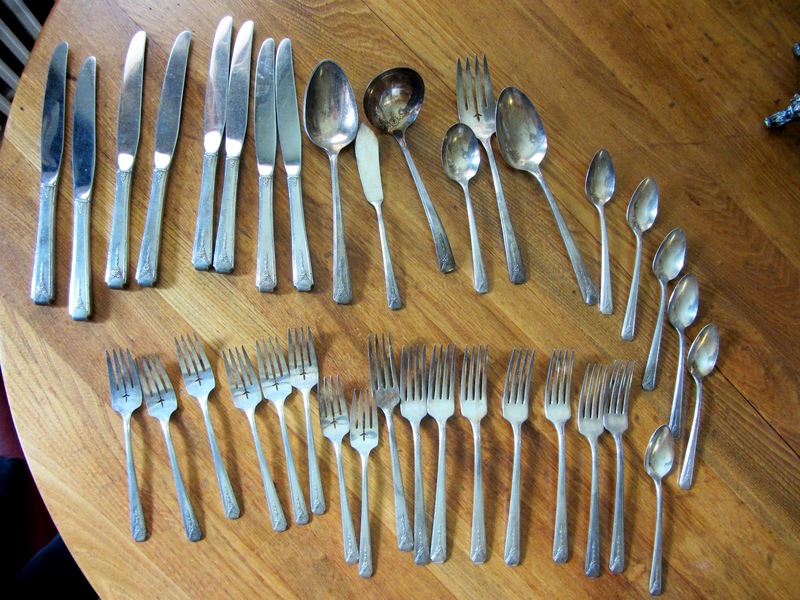 I found 8 table knives, 8 forks, 8 salad forks, 6 teaspoons, 1 sugar spoon, 1 butter knife, a large serving fork, a ladle, and 3 serving spoons (two are stacked), all for $6 in a large baggy. I am going to have some special tablescapes with this beautiful set! I think I got a great deal! 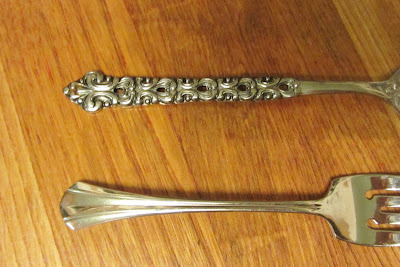 Very beautiful...I love silverware...you might look on Ebay or Replacements...if you are missing a piece or two! You got an amazing deal. Your table will be so pretty set up with your new flatware. Very pretty pattern. My first set was from Japan too and it was (is ~ I still have it) UUUUUGly. My husband likes it for some reason. Go figure. Will look forward to those tablescapes now. Oh I do love this silverplate! How do you clean silverplate . I have my grandmothers. I ended up using my oneida silverware....not sterling .....for everyday. Now most is gone. It had pretty daises on them. We eat silverware around here. Carlene...you are one lucky gal! Whoo Hoo! What a great deal and the pattern is really pretty...not too fancy..not too plain. I can't believe you got ALL that for $6. Wow! This was my parents' pattern. They bought it when they married in October of 1945, right after my father came home from the war. My niece has it now, and I've been enjoying myself with extending the set and buying different pieces. It's a beautiful pattern! Enjoy.